The Plantronics SupraPlus headset family brings new standards in all-day comfort and reliability to telephone professionals. 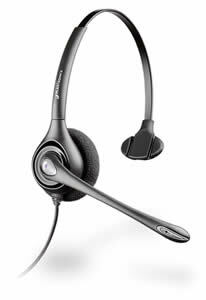 Enhanced receive-side audio quality, an intelligent flexible boom and stylish design provide greater headset flexibility. The SupraPlus P251N features a single earpiece with a foam ear cushion to block out background noise and a noise canceling microphone. This headset is designed for telephones that provide built-in amplification, such as Nortel's Norstar business phones. Note: This model is also available with a voice tube.